If you're looking for an epic U.S. road trip, you cannot do better than this one. We took 11 days to explore the best of what Nevada, Arizona, Utah, and Colorado had to offer in this incredible (and family friendly!) road trip from Las Vegas to Denver. As a child, I traveled often with my parents: we did the typical trips to Walt Disney World, but we also went snorkeling in Key Largo, took a road trip along California's Highway 1, and explored Canada's Prince Edward Island. One thing that we always talked about doing was a road trip to the Grand Canyon, Yellowstone, and other national parks out west. Things happen, my sister and I grew up, and we never did make the trek out west like we said we would. I still wanted to go badly, but somehow domestic travel always fell by the wayside as I ventured to England, Ireland, Scotland, France, Germany, the Bahamas, and beyond. 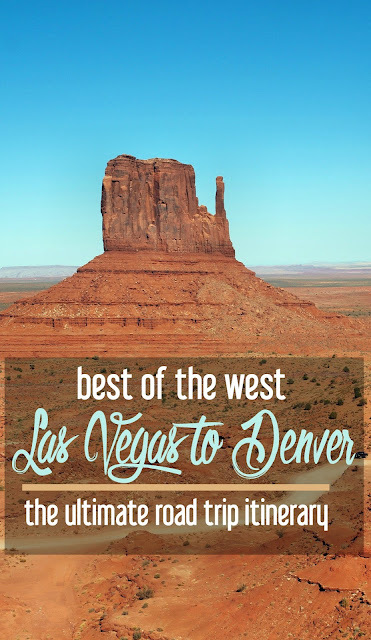 The desire to head out West again came up earlier this year when my husband, Landon, and I were brainstorming where we wanted to go on our major trips. Since he has a set number of vacation days, I try to work our family vacations around his schedule so he can join us on as many adventures as possible. "You know, Denver's really close to Glenwood Springs. I've always wanted to go to the hot springs. Oh, and if we're in Glenwood Springs, that's just a few hours from Moab. And Moab is not that far from Monument Valley. I'VE ALWAYS WANTED TO GO TO MONUMENT VALLEY!! And if we drive that far, we might as well tack on a trip to the Grand Canyon. And Route 66. And Las Vegas!" So, our long weekend trip to visit family ended up turning into this massive point-to-point road trip through 3 national parks. It was a lot to organize, but I'm so happy I've finally fulfilled my childhood dreams by going. If you're planning your own Western U.S. road trip, here's the itinerary we used, including the places we stayed, activities we did, and places to eat. I've also added notes on how to expand your itinerary if you have longer to spend in each area than we did. If you didn't have two tired kids in tow on your road trip from Las Vegas to Denver, you could do as the guys sitting near us did: get off the airplane and immediately head to the Strip for food, drinks, and fun. However, if you're old before your time (like me) and/or have an infant and preschooler in tow, I'd suggest grabbing your rental car, driving down the Strip to see the Bellagio fountains and all of the lights before calling it a night. OVERNIGHT: Best Western McCarran, Las Vegas, Nevada. It wasn't glitzy or glamorous, but it was clean, very close to the airport and the Strip, and perfect for a quick overnight stay. And, I got Best Western points for future trips. Yay! Expand Your Trip: if you have extra time available, I would recommend spending more in Las Vegas than we were able to. Instead of following our itinerary, I'd add in another day here so you could better enjoy the city's offerings. Catch one of the many shows, go shopping, or try your luck at one of the casinos. Then, you could pick up the itinerary below when you'd had a day or two in Las Vegas. After my husband went running, and we did another quick cruise along the Strip, we stocked up on snacks and baby supplies at a local grocery store. Within half an hour of leaving Las Vegas, we were stunned at the topography: gone were the flat stretches of land and tall buildings, and all around us were massive cliffs and scrubby desert plants. We were going to stop at the Hoover Dam, but had gotten out of Las Vegas later than expected and didn't want to miss Route 66, so we pushed onwards. I'm glad we did since I'd always wanted to drive down a portion of the Mother Road. My daughter didn't have much knowledge about Route 66 other than what she'd absorbed from Cars, but even that was enough to have her shouting, "That looks just like Lightning McQueen's house!" It's amazing how much the illustrators were able to incorporate from the landscape and architecture along Route 66 into that movie, and how much of it translates from cartoon to real life. This was our longest day of driving, but we passed the time by reading off the funny Burma Shave signs along the road, and stopping about every 15 minutes to take more photos. By the time we made it to Seligman, Arizona, we were all ready to stretch our legs. We took in some Western history and ate classic American grub at the Roadkill Cafe. The attached O.K. Saloon is an actual Wild West saloon, and guests are invited to wander the building to look at the antiques and photos on the wall. The menu items at the Roadkill Cafe all have cringe-worthy names like the "Poached Bambi Burger" to tie in with the restaurant's theme of "You Kill It, We Grill It." Comma splice aside, the motto is in name only--nothing on the menu is actually roadkill, and it's all in good fun. After our meal, we poked our heads in the Arizona Territorial Jail before heading down the street to Delgadillo's Snow Cap Drive-in. Here, you'll get plenty of puns from your server before you're served a huge milkshake, each of which comes with a blend of two flavors from their lengthy ice cream menu. We cruised into the Grand Canyon just as the sun was setting, which made for some spectacular views from the South Rim. We checked into the Bright Angel Lodge and attended a free ranger talk before calling it a night. TIP! If you plan on staying inside Grand Canyon National Park, book way, way ahead. I started looking for reservations three months before our big road trip from Las Vegas to Denver, which I thought would be plenty of time, but I was so wrong. Everything was sold out! I started checking the Grand Canyon website multiple times a day in the hopes of catching a cancellation and lucked up: I got a room at the Bright Angel Lodge. The upside is that the lodge is RIGHT on the rim, but the downside is that our room had to use the communal bath area. Expand Your Trip: You could easily break this day up into two, using the first to explore Lake Mead and the Hoover Dam, and the second to drive along Route 66 towards the Grand Canyon with more stops in Peach Springs and Kingman. If you wanted to approach the Grand Canyon from a different perspective, you could stay in Williams, AZ, take the train up early one morning, stay the night at the South Rim, and then head back to Williams the following day. From Williams, you could then drive up the itinerary and head towards Utah. Although I'm easily overexcitable, I very rarely burst into tears. However, when we first glimpsed the Grand Canyon through the trees on our drive in, that's exactly what I did. The scope and beauty of the Grand Canyon is so overwhelming and so beyond any words I could share: it's emotional on a level that I've rarely discovered on my travels. We started the day by working on Britton's Junior Ranger booklet and attending a ranger talk on the park's fossils. We walked a little ways down the Bright Angel trail before heading back to our car to drive through the park. Our stops on the Desert View Drive included the Tusayan Ruins, the Moran Point lookout, and the Desert View lookout. Sadly, we had to leave the park behind as we had other plans awaiting us just over the Utah border. On the drive towards Utah, we passed through the Painted Desert (there are several scenic overlooks: they're all gorgeous, and you should stop at least once or twice). Between Tuba City and Kayenta, the landscape changes drastically about every 20 miles, so keep your camera at the ready. We ended the day by driving through Monument Valley, but didn't stop since we had the entire next day allotted for exploring. Expand Your Trip: You definitely need more than one night and one day at the Grand Canyon, but we just couldn't fit anymore time into this trip. I'd add in one or two longer hikes (there are plenty of easy ones for young families), or, if you're able, I'd love to do the hike down into the valley to spend the night at Phantom Ranch. Monument Valley, a part of the Navajo Nation, is best known for its appearance in dozens of Western movies: pretty much anything you've ever seen with John Wayne in it was filmed here. It's also where Forrest Gump decides to end his massive cross country run. Beyond its place in American pop culture, Monument Valley is an important place for the Navajo people. There are ancient drawings on some of the rock structures, and the massive Rain God Mesa in the heart of the park is where medicine men pray for water for their people. Take your time (and plenty of photos) at each stop, and plan on spending between 2-3 hours in the park to fully enjoy it. You'll also have time to stop at the Mexican Hat, the namesake rock formation of the small town we stayed in. It's such a strange looking formation since it looks as if it's going to topple over at any moment! That night, we ate at the little restaurant at the San Juan Inn, the Old Bridge Grill. We had Navajo tacos, which were like a giant funnel cakes piled with taco meat, refried beans, tomatoes, and lettuce. YUM. Expand Your Trip: From Mexican Hat, you're just under 2 hours to the 4 Corners Monument, so that would be an excellent day's addition to your itinerary. The Valley of the Gods would also be another great day out in the area, but to fully enjoy it, you'll need a vehicle with high clearance and 4-wheel drive since it's a remote park. 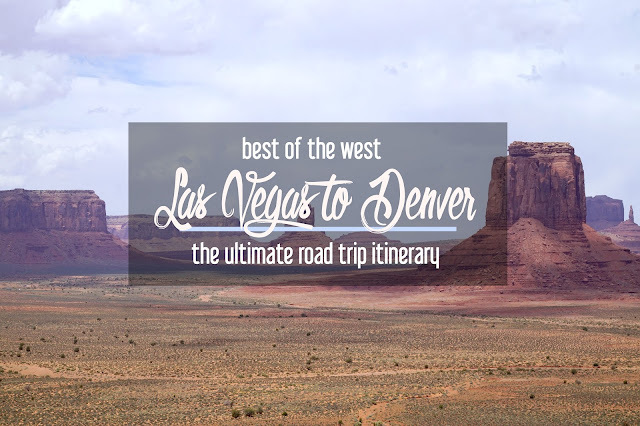 Of all of the places that we saw on our road trip from Las Vegas to Denver, Moab and the Grand Canyon were the two that we could have easily spent a week at each. For our first day in Moab, we ate lunch and did a little shopping in downtown, and then headed out for a hike to Bowtie Arch. Along the drive from downtown Moab to the pull off for Bowtie and Corona Arches, you'll be able to see petroglyphs right alongside the road. Don't miss those! We went on the hike to and from Bowtie Arch with our preschooler and infant, and it was definitely doable for 4 people from a very flat part of the country with little prior hiking experience. Plus, it was a beautiful (and not very crowded) way to introduce us to this gorgeous area. Once we'd gotten back to the car and rehydrated, we got up close with some incredible fossils over at the Mill Canyon Dinosaur Trail. Just inches from your face, you can see dinosaur vertebrate and leg bones, and a giant petrified tree trunk. Extend Your Trip: Devote at least a day or two to Canyonlands National Park. We completely ran out of time to see this park, and it is #1 on our list for our return visit to Moab. We spent the majority of our day sightseeing around Arches National Park, which had been on my must-see list for years. Our favorite spots were the Windows Arches (we did the easy 1 mile hike around the base), and Sand Dune Arch (my preschooler loved walking in the sand along the way!). I'd love to go back when the kids are older and visit the Fiery Furnace, which looks absolutely stunning. Camping at the Devil's Garden campground is also high on the list of things to do on a return visit. If you're going in 2017 or early 2018, be warned: there is so much construction going on all over the park (Devil's Garden was completely closed), and traffic is a nightmare. The parking lots are very small for the number of people who were in the park, and we spent at least 20 minutes at each area searching for parking before we found a spot. In a few places, it was so crowded that we never did find a place to park and had to head on to another part of the park. We ended the day with a cookout back at our campground and s'mores by the fire as we gazed at the view of the La Sal mountains. Extend Your Visit: With more time, I would've visited Dead Horse Point State Park (where the infamous car jumping scene from Thelma and Louise was filmed, as well as the opening credits of Tom Cruise free climbing a butte in Mission Impossible 2). If my kids were a little older, I would've also wanted to do a tubing tour down the Colorado River. After a mind-numbing drive along the most desolate stretch of I-70 that exists, we arrived in Grand Junction, the biggest town we'd seen since we'd left Las Vegas a week earlier. We headed straight to the Dinosaur Journey Museum, which was conveniently located right off of the interstate. It's a small museum compared to some of the other dinosaur-centric offerings in Colorado, but it is well put together and very cool. Our next stop was the Colorado National Monument. I wish it hadn't been such a damp, raw day because there were areas that were obscured from fog and rain clouds, but we saw enough to realize how beautiful this park was. On a nicer day, I would've loved to have done a few of the easier hikes in the area. As a note to whomever is driving, go slowly. The cliff faces are sheer and thisclose to the road. It's not for the faint of heart, and there's a good reason that the speed limit maxes out at 25 mph! Extend Your Visit: There are some beautiful areas just outside of Grand Junction, including several wineries. It might be tempting to rush from Grand Junction to Denver, but that would be a big mistake. You'd miss the adorable town of Glenwood Springs with its historic hot springs and downtown. We spent an entire day meandering along I-70 towards Denver, and I'm so glad we didn't have anything set in stone. It was so much fun to stop along the way wherever we felt like it! We hit our highest altitude yet (nearly 12,000 feet above sea level!) as we came through Loveland Pass. We stopped for lunch in Breckenridge and started to plan ski vacations back to the area for future years. We looked for bighorn sheep (unsuccessfully) in Georgetown. By the time we coasted into downtown Denver, we'd gotten a taste of what the ski resorts of Colorado were like...and realized that we could've made this entire 1.5 week trip into a 3 month visit! Our kids were exhausted from getting in and out of the car all day, so we had a quick dinner cobbled together from room service at Hotel Teatro and a convenience store right around the corner. Extend Your Visit: Instead of just blasting through the ski towns, I would spend a day or two skiing or hiking (depending on the season) in Vail, Breckenridge, Frisco, or Keystone. Our time in Denver was guided by the fact that my husband's brother and his family live there, so we didn't get as much sightseeing time in as we would've otherwise. It was so much fun to hang out with them because we don't get to see them but once or twice a year typically! Brunch at Snooze. So much incredible food, so little time. I got the smothered hashbrowns and still dream about them. The wait is absolutely worth it! We went to the Union Station location, so we got to see that gorgeous building as well. Denver Museum of Nature and Science. Part science museum, part kids' museum, and completely amazing, this is one of the best immersive museums I've seen lately. There's everything from a planetarium and IMAX theatre to a hands on science lab and astronaut dress up area. Golden, Colorado. We spent one gorgeous evening lingering along the Riverwalk before heading to dinner at Mountain Toad Brewery. We ate these amazing meals from Farmer in the Hive, a little food truck that was featured at the Brewery that night. City Park. Located just across the way from the Denver Museum of Nature and Science and the Denver Zoo, this massive park has trails, summertime concerts, multiple lakes, and a huge playground. Extend Your Stay: Denver is an incredible city with far more to do than what we could fit into just a few days. Red Rocks (just outside Denver) is a popular music venue with incredible acoustics, while downtown Denver boasts MLB games at Coors Field, multiple performing arts venues, an aquarium, and a kids' museum. Have you visited any of these places on our road trip from Las Vegas to Denver? Which would be highest on your must-visit list? This post contains affiliate links; I will receive a small commission at no additional charge to you if you choose to purchase through the above links. Also, I received complimentary passes to the attractions listed in Glenwood Springs, and a complimentary stay at Denver's Hotel Teatro. All other attractions and accommodations were funded by my tiny bank account. All opinions are my own.